Enjoy a truly inspiring adventure through Northern Tanzania on this eight day safari adventure. You’ll seek out Africa’s iconic birds and animals on game drives through Lake Manyara and the Serengeti with the chance to see lions, cheetah, leopards, elephant, giraffes and more. And the scenery is just as spectacular as the wildlife – enjoy enchanting views over Ngorongoro Crater and take a swim in rock pools beneath a waterfall. You’ll be met on arrival at Kilimanjaro airport where you’ll be transferred to the African Tulip Hotel in Arusha for dinner and an overnight stay. After breakfast you will have a morning at leisure with time to enjoy the private game sanctuary that surrounds the lodge. 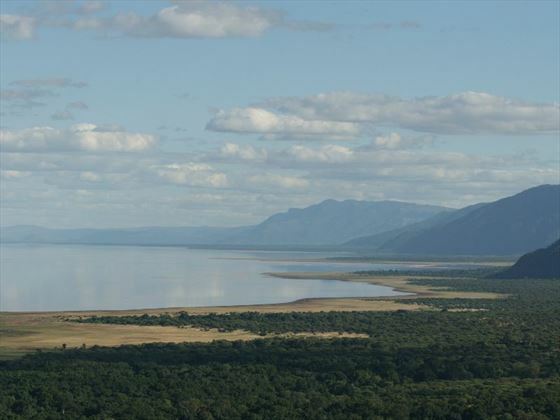 You’ll head back to town for lunch before departing for the wonderful Lake Manyara. On the way you’ll pass through small villages giving you a glimpse into local life here. You’ll leave civilisation behind as you experience the majestic natural beauty of Tanzania’s wide open landscapes with impressive mountainous hills and leafy forests dominating the horizon. The stunning scenery continues as you cross the Great Rift Valley and arrive at Lake Manyara Wildlife Park which sits up on a hillside with lovely views. Here you’ll have dinner and a welcome sundowner. After a tasty breakfast at the lodge you’ll descend the hill and enjoy your first game drive in Lake Manyara National Park. With an impressive variety of wildlife ranging from the famous big cats to towering giraffes and mesmerising hippos you’ll be wowed by the sheer variety of incredible sights. 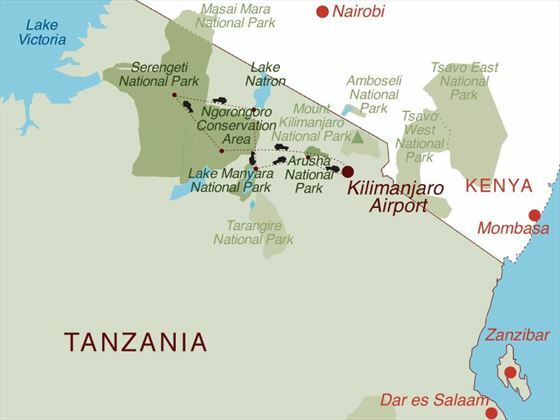 Around midday you’ll depart for Lake Natron, up through the Great Rift Valley. 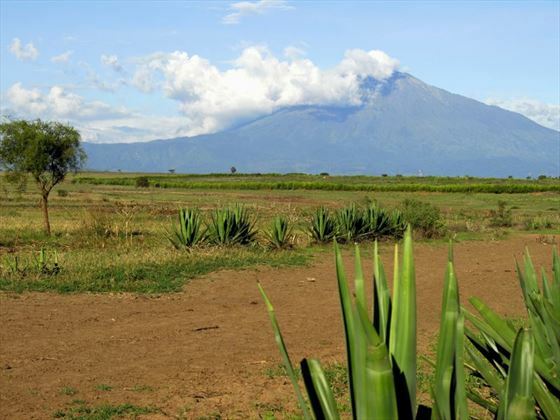 There’s a continuous stream of awe-inspiring scenery on your journey with undulating hills making way for lofty mountains including Ol Doinyo Lengai, an active volcano. 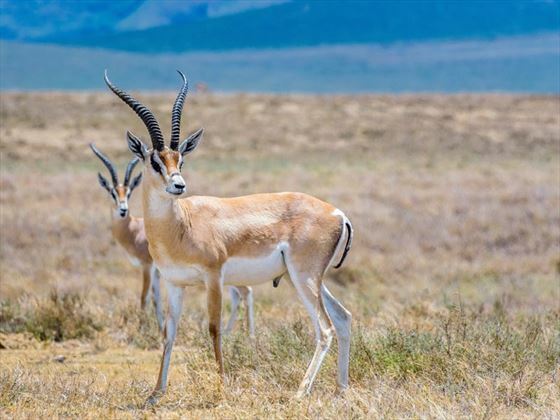 You’ll pass Maasai villagers and warriors, as well as getting the chance to see more wildlife including zebra, Thompson’s gazelle and antelope. 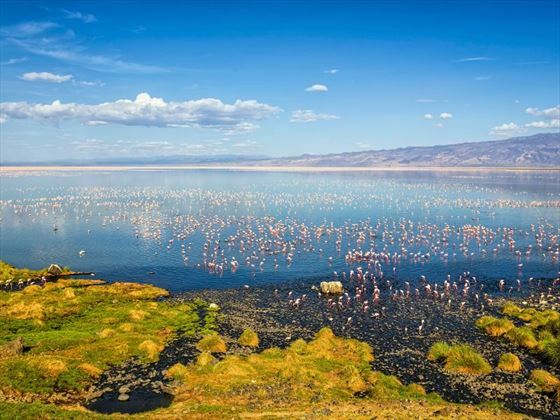 Finally you’ll drive past the base of Ol Doinyo Lengai and Lake Natron, a breeding ground for many flamingo species. It’s not long before you arrive at Lake Natron Camp which sits by a peaceful stream. Today you’ll take a walk down to the shore of Lake Natron watching out for birds and other animals en route. When you arrive at the lake you’ll be treated to lovely views of pink flamingos and other water birds. You’ll then head back to camp for lunch before heading out to the sight of a waterfall running out of the hillside. From here you can enjoy panoramic views of the countryside and if you want, you can go for a dip in one of the rock pools nearby. After breakfast at the camp you’ll set off in search of the world-famous Serengeti. You’ll be treated to wonderful views en route as you pass the Cycad Valley and on to the Sonjo area. 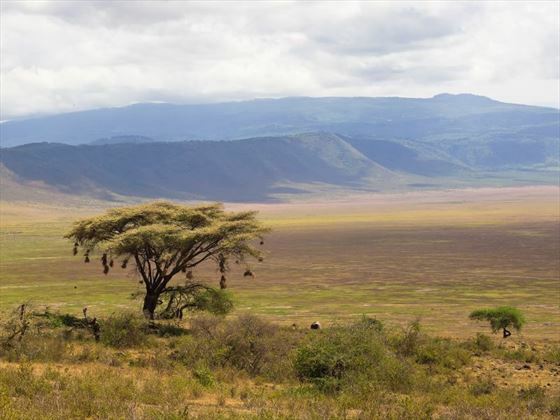 You will then head onwards through the open plains of Ngorongoro Crater into the highlands of Piyaya beyond. 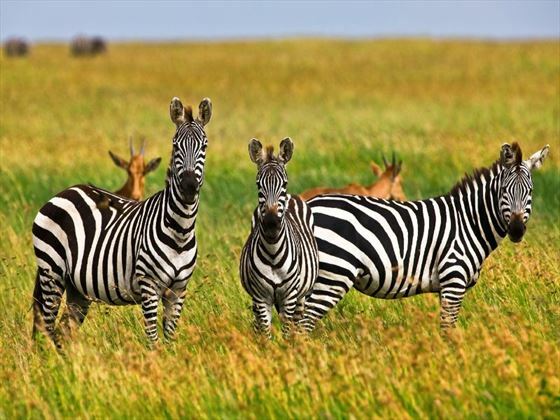 During the migration months you’ll have the chance to see thousands of zebra and wildebeest, closely followed by big cats and Cape Hunting Dogs. Enjoy views of the Gol Mountains and pass the gigantic Nassera Rock where you’ll stop for a picnic lunch. After a five hour drive across a secluded stretch of Tanzania you’ll arrive at Naabi Hill in Serengeti National Park. Head out on a game drive in the park before heading to Seronera Wildlife Lodge for dinner and overnight. You’ll have breakfast at the lodge before setting out on a full day of game viewing with the opportunity to see the most impressive big cats in Africa – lions, cheetahs and leopards – and a huge range of other wildlife. Departing from the Serengeti early you’ll take a drive through the highlands of Ngorongoro which will give you impressive views of the crater. You’ll then head downwards to the plains which have a rich array of unique wildlife as well as lakes, acacia forests, steams and swamps. With the chance to see enormous elephants, lions and cackling hyenas you can’t help but be impressed by the landscape. You’ll then arrive at the Ngorongoro Wildlife Lodge where you’ll spend the night. Today you’ll have breakfast and then leave the lodge behind as you drive back to Arusha through the Rift Valley. When you reach Arusha you’ll have lunch before being dropped off at the airport to catch your onward flight. The Tanzania Explorer Safari is a private safari and is available to book any day of the week throughout 2017.